Today was a pleasant day. Neil did his usual bike ride down the beach road and Connie got some beach time. After his ride, Neil joined her and they enjoyed the beach until noontime. A sandwich was obtained and after lunch we just enjoyed watching the ocean from the patio for the afternoon, since it was in shade and Connie didn’t want to get too much sun. Connie, designated the “dining and lodging coordinator,” scanned the local restaurant guide for a good place to go for dinner. Unfortunately , some of the usual places on the Soundside in Nags Head are still closed for repairs after Hurricane Irene. However, after much review, Connie chose Mulligan’s Raw Bar & Grille. 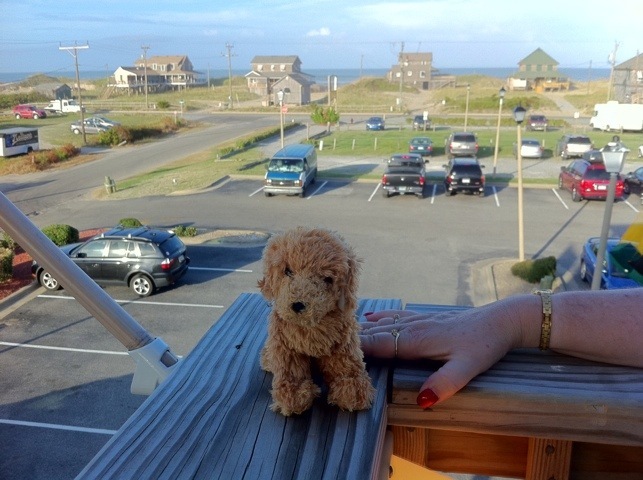 They have an outside deck where you can eat and enjoy a view of the ocean. They decided to start with appetizers and work up from there. A She Crab soup was on the menu which was advertised as being packed with crabmeat. They each ordered a cup. Unlike most She Crab soups, this one was not made with heavy cream. It was creamy, but lighter in texture and lived up to it’s claim regarding the amount of crabmeat. Both Connie and Neil agreed that the lighter texture was perfect for the beach and enjoyed it very much. After this, as you can see by the picture, Neil finally got his Oysters! They were very good, but seemed small compared to what we usually get down here. But, they were perfectly fine and provided with lemon, horseradish, and ketchup. Service was a little sketchy as the server seemed a little at odds to begin with as the deck seating started to fill up. But luckily, the service area was nearby and we were able to get crackers, napkins, and utensils for ourselves. After that we decided we were still a little hungry but not enough for a full dinner, so we got one fried oyster dinner to share. It came with Hush Puppies, fries, and cole slaw. The oysters were tasty! The hush puppies were good, the fries were OK, but a little overcooked, and the cole slaw was too salty to eat. That last was a shame because it seemed to have a good flavor otherwise. This entry was posted in Travel and tagged OBX, Travel. Bookmark the permalink.